Not long ago Chicks On Speed Records put out their collection of music by female avant-garde artists and bands. It's called Girl Monster and spreads over three cds. And a while ago another fine blog (xPQwRtz) put together a compilation of "indie girls". My old radio show also started a series on the theme a few weeks ago, and so far they've had a Girls At Our Best! special amongst other things (more about them below). 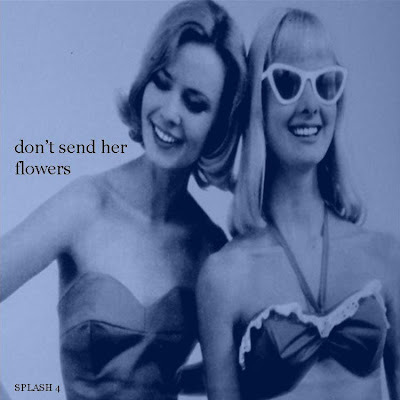 Don't Send Her Flowers is something in the same vein - about women making music and people making music about women. This means to say, the songs won't ONLY be by female artists or bands including women, which would be as stupid as a program with male artists only. This theme also comes rather naturally since the current module of our Art History course is Women Artists. And Art and Music is all the same thing, as you well know. Elizabeth Price is one of my favourite female vocalists. She left Talulah Gosh to form baroque-twee duo The Carousel together with boyfriend Greg (who was in a band you might have heard of, called Razorcuts). Early Carousel might just be the jangliest band there is, which makes them all the dearer to me. Vinyl Japan made a compilation of their singles, called I Forgot to Remember to Forget in 1993, and that's where you are most likely to find this track. This is a band that existed in Sweden a few years ago, but has recently resurfaced on that strange phenomenon known as MySpace. Only member Jenny Franzén has put up a song recorded this year called "I Can't Do Anything". Which is a fantastic song, but this is another one, included on last year's goodbye compilation from the My Secret Garden cd-r label. The sound is much better than I remember from earlier stuff, and proudly flaunts its Phil Spector influence. Soul music has a fair share of impressive female vocalists and vocal groups (although female instrumentalists are admittedly rare). This song (written by Curtis Mayfield) was recorded by a group called The Opals in 1965. Just like last week's northern soul track it was released by the Okeh label. The Opals were from Chicago too and were discovered by The Dells, who have put one of my favourite northern hits to vinyl: "Wear It On Our Face". The Opals are incidentally the backing vocalists on Betty Everett's "It's In His Kiss". So, here's that RPD track! This song is just marvellous, I like it even better than "Flowers In the Sky", that was included on CD86. That was their first single and the second to be out on Creation. (And a song about flowers!) I really have to get that book on the Creation story because the early scene is a real mess, everyone playing in each other's bands. I've done some research and apparently, the band was started by Andrew Innes (who had played in McGee's earlier band The Laughing Apple and later played with Biff Bang Pow!, before joining Primal Scream) and his girlfriend Christine Wanless (who also sings on some Biff Bang Pow! numbers and later formed The Formica Tops) and like Biff Bang Pow! they took their name from a song by The Creation. The Revolving Paint Dream at various times seems to have included Luke Haines, Alan McGee and Richard Green. The Creation records guru JC Brouchard probably had a finger in this thing too. Like "In the Afternoon", the b-side of "Flowers In Sky", this single is graced by Wanless' unique voice. Their music covered a wide range, from reverby paisley pop like this to droning seven minute instrumentals with mind-bending guitar-playing. Another recent reissue is LTM's collection of Aberdeen's early singles. Aberdeen were not from Aberdeen but California and were one of the last bands to be signed to Sarah Records. These early singles have been very hard to find, so this comp is warmly welcomed. Beth Arzy is an excellent singer, and also a nice person, I can confirm after having met her. She now plays with Trembling Blue Stars, you see. And she is also Bobby Wratten's girlfriend! Not strange then, that she appeared as guest vocalist on the Occasional Keepers album from last year. I think Aberdeen still exists, because their last record isn't all that old. But they're probably based in the UK now, as Beth lives here. This song was originally on the Byron EP from 1994 and on Sarah. This band seems unjustly overlooked to me. I had never heard of them until Jörgen told me about them a few months ago. It's a British one-man-band consisting of Mark Cohen. He's been writing songs with jangling layers of guitar and put them out on tapes since 1991. Finally in 1999 an album called Wait All Summer came out on Apricot, collecting the highlights of previous releases. The songs are slightly laidback - if you're in the wrong mood you might say overly monotonous. But that's only if you don't make the effort to make out all the guitars that are piled up on top of each other. "To See Her" also has a very sweet lyric speaking for it though. This is the side project of three members of The Bats from New Zealand (plus one other guy). They've released two eps so far, but this a new song that is to be found on their MySpace page. It's at least as good the best from At the National Grid! Recent Drama is sure to land pretty high in my end-of-year album list, and here's a song from that. The first time I heard it, I just assumed it was about a girl, without any reason whatsoever I now realise. Just like most Pants Yell! songs it's pretty vague gender-wise. American The Snowfaires released their third and last album recently. It's an eight track LP called Voila! that comes in silk-screened (by hand) sleeves. Arguably their first album Feel You Up was their best, as I thought Get Married was a bit too rock. There's one track on the new album however, that is more in the tweepop vein of Feel You Up. And it might be their best effort yet - or ever I should say. It's over ten years since Fat Tulips split up now, but they'll always be one of twee-punk's finest. And they've got lots of angry songs about boys. This cover is a bit more mellow, but still as on the spot. It's from their 1993 Albie EP, and a cover of a song by new wave band Squeeze. Our Swedish band of the week is one the best tweepop groups ever from my home country, and there's been a few... They were from Stockholm but don't play together anymore. One of them has a new project called After-School Sports. The MySpace account is all the trace there's left of them, and this is one of two amazing tracks there. Write to them and coerce them into getting back together! This very influential band for female musicians from the mid-eighties onwards actually only included one girl. Their only album Pleasure was released in 1982 and included this song. This is post-punk at its best as well, going in the direction that would eventually lead to indiepop. One band for which Girls At Our Best! meant a lot were their "successors" Dolly Mixture, who were more or less contemporary with them. They continued a bit longer however, and were even more POP! I've actually got a live recording of them playing the previous song by Girls At Our Best! Their lead singer subsequently became quite famous as Saint Etienne guest vocalist and one half of Birdie (together with Paul Kelly of East Village). Dolly Mixture did a handful of singles but as no one would let them record an album, they created Dead Good Dollys and released Demonstration Tapes in 1984 - a double album of their demos that now commands very high prices. I hope you'll excuse me for including this hissing, unreleased track instead of something from that, because it was more suitable for our theme. The Melons were another overlooked British indiepop group. They missed the big tweepop wave, kind of like The Haywains, but their songs are every bit as good. This one is from their Stricly Melonhead EP from 1994. This band was featured in DROP 15 with the song that has inspired the title for this show. And they're also in the picture you can see above! That song was from a double a-side single released in 1991, and this is the other a-side as it were. The Haircuts – What's a Girl to Do? Ryan from California and Theresa from Canada made up The Haircuts. Because they are no more. Even the full-length that came this year was a bit of a surprise. But that was their first and last album. It's named Sorrow Is the Way to Love after a song by The Carousel. This is one of the more lo-fi tracks on it and one of those sung by Teresa. She's got her own project called Junebug, which we look forward to hearing more from. Ryan's got lots of projects, as always. Someone asked for some Tiger Trap and Tullycraft, so here you are. I just found a real, material copy of Tiger Trap's Sour Grass EP! I've only had it in the digital version before, and I still can't play any vinyl over here, so here's an old mp3 of "Don't Ask". I wonder where Tullycraft would have been without The Judys? This is one of several Judys tracks that they've covered. It's not as good as the original of course, but you can't blame Sean & Co for trying. You can find this song on their Singles collection. When Tracey Thorn dissolved the Marine Girls, the remainder formed a new band called Grab Grab the Haddock, who released two eps on Cherry Red. This song if from 1985's Four More Songs By Grab Grab the Haddock. This must be one of the most beautiful songs about a girl anyone has written. Glenn Melia really is an expert on the matter, being the author of songs like "Antoinette", "Charmelle", "Josephine, Why?" and "Wanda". It's safe to say St. Christopher is one of my favourite, favourite bands and that Glenn Melia is possibly the best male pop singer ever! This swooning number is from the You Deserve More Than a Maybe 7", their first release on Sarah. have to download this and give it a listen, maybe this weekend when i can breath out while sitting on the tube on my way to work. really curious, the lighthouse keepers song, is it taken from the lp or the compilation? because they sound really different, the original ones on the lp are in my taste a lot better. jörgen most propably told you this, mark cohen was in the band fragile, whom i hold high. though i've only heard maybe 5 songs... their "not for sale" is kind of my view on mimg=)and the music scene as whole. i've been meaning to check out fragile, yes, but i haven't gotten hold of anything yet. as for the lighthouse keepers, it's from the album called "tales of the unexpected". jyrki, if you mean the "lipsnipegroin" comp from 1992, i haven't heard it so i wouldn't know if it sounds different!